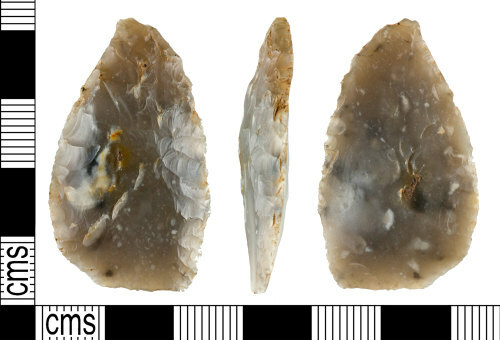 A complete knapped lithic implement of late Neolithic to early Bronze Age date, circa 2700BC - 1600BC. The implement is a plano-convex knife formed from a tertiary flake which is D-shaped in plan and section. The ventral surface is mostly smooth with no visible bulb of percussion and the dorsal surface is covered with short, low angle, scaled retouch. The flint is a dark grey colour. The implement is 38.7mm long, 23.3mm wide, 6.4mm thick and weighs 5.9g.